the HAES files: does bariatric surgery cure diabetes? Editor’s Note: November is National Diabetes Awareness Month. We asked one of ASDAH’s new members, who is a passionate diabetes educator, to answer the question “does bariatric surgery cure diabetes.” Laura’s piece provides a clear understanding of just how our bodies work when challenged with diabetes and the impact of bariatric surgery. ASDAH would like to see a more transparent approach by doctors as they make recommendations to their patients about this life altering surgery. A couple of months ago Reuters released the findings of a study reported in the Archives of Surgery, touting that weight loss surgery as a miracle cure for diabetes. As a diabetes educator I feel that this may be somewhat misleading and to be fair, I feel there is a “rest of the story” that needs to be added. First, let’s define diabetes. Diabetes is simply an imbalance of supply and demand of insulin. Insulin is a hormone that allows glucose (the type of sugar that the body uses for fuel) to get from the blood to the muscle cells. Insulin works like a pump at the gas station. Without insulin, you will literally starve to death no matter how much you eat. This is because no matter how much sugar you have in the blood to use as fuel, you can’t get it from the gas station to the car. Type 1 diabetes is a problem with supply of insulin. No matter how much is eaten, without insulin the sugar hits a road block and ends up in the toilet rather than the muscle. This is why people with type 1 diabetes lose weight. Without insulin the only thing that can be burned as fuel is fat….hence weight loss. In type 2 diabetes the most prevalent problem is usually demand. Rather than being a problem that the body can no longer produce insulin, it is usually more of a problem of insulin resistance. In other words, the gas station has pumps, but they are pumping very slowly. This requires many more pumps to get the same amount of gas to the cars. The pancreas has to work overtime to get enough insulin. As long as the pancreas can keep up with the demand a person can be very insulin-resistant without having diabetes. We define diabetes as a build up of sugar in the blood when the demand is greater than the supply of insulin. There are things that can affect supply of insulin. The most significant factor is how strong and healthy the pancreas is (largely due to genetics, but possibly impacted by injury). Pancreatitis can also decrease insulin production. Type 1 diabetes is an autoimmune disease where the body has attacked the pancreas, making it unable to produce insulin. However some claim bariatric or weight loss surgery (WLS) is a cure for Type 2 diabetes, which is often a problem with demand for insulin more than supply. There are many things that affect demand. The more calories that are eaten, the more insulin is needed to get the sugar from blood to muscle. The type of calorie (fat, protein, carbohydrate or alcohol) also affects demand. The faster the calories turn to sugar, the faster insulin is needed ( and the harder the pancreas has to work to supply the demand.) Carbohydrates (especially if it is a sugary liquid) turns to sugar the fastest, which is why we pay most attention to them in diabetes. Exercise helps the insulin to work harder. Exercise will not always fix insulin resistance, but it does help it. On occasion, exercise actually increases sugar as exercise will only lower sugar in the presence of insulin. Stress makes insulin resistance worse due to hormones such as epinephrine and cortisol. Depression and anxiety, lack of sleep or poor quality of sleep will also make insulin resistance worse. Heredity also plays a big factor in insulin resistance. Insulin resistance often leads to increased hunger and decreased energy, which leads to weight gain. The increased weight then leads to even more insulin resistance. This cycle is very difficult to break. Weight cycling (yo yo diets) also make insulin resistance worse. Incorporating healthy lifestyle changes such as eating well, getting exercise, reducing stress, or getting enough sleep, decreases the demand of insulin. And often, improvement in these areas results in weight loss as a side effect. Improving insulin resistance leads to less hunger and more energy. So it appears that weight loss is what caused the “cure” of diabetes, when actually the activities that help insulin resistance caused both the weight loss and decreased demand of insulin. If you lose weight without lowering calories or exercise, you do not get the same decrease in demand of insulin (such as weight loss with cancer.) If you surgically remove fat, such as in liposuction, you also don’t get the decrease in demand. If you intentionally gain weight, but do it with a healthy diet and exercise, (such as a sumo wrestler might do) you do not get the increased demand. It is not the weight; it is the behavior that affects the demand of insulin. When you engage in healthy behaviors, you get the benefit with or WITHOUT weight loss. That is why even as little as a 5-7% weight loss will be beneficial in decreasing the demand. And why if you lose weight and keep it off, but now have a stable weight, the benefits in the decreased demand wane over time. This is also why it is so hard to lose more than 5-10% of the weight. So back to the original question….does bariatric surgery “cure” diabetes? The two most common procedures currently done are: The Adjustable Banded Gastroplasty or Lap band (restricting calories) or the Roux En-Y (restricting calories and limiting absorption.) The immediate drop in calories (more so with Roux En-Y due to both decrease in food eaten and food absorbed) significantly decreases demand of insulin (less insulin is needed for less calories.) Depending on the supply and demand, this decreased demand may now make the difference between making budget or not. Therefore there are times the surgery appears to have ‘cured’ diabetes even before weight loss has occurred. Reducing calories in general such as in garden variety weight loss will produce the same effect and look like it “cures” diabetes, when in actuality it too just decreases demand. Usually with weight loss diets, the drop in calories is not as sudden and drastic and usually weight is lost before benefit is seen. Either way, as you get older, you need more and more insulin, and your ability to produce insulin decreases over time. Therefore as you age, the potential for an imbalance of supply and demand is still there even if it was previously “cured.” So whether weight is lost because of surgery or because of healthy changes in behaviors, there is the possibility of diabetes reoccurring. So perhaps the more important question is which path is the best path to reducing insulin resistance and perhaps balancing the supply and demand for insulin: embracing a Health At Every Size® way of life where you meet the nutritional, physical, and emotional needs of your body even if weight is unchanged, or weight loss surgery which may have on average better weight loss but has significant side effects. 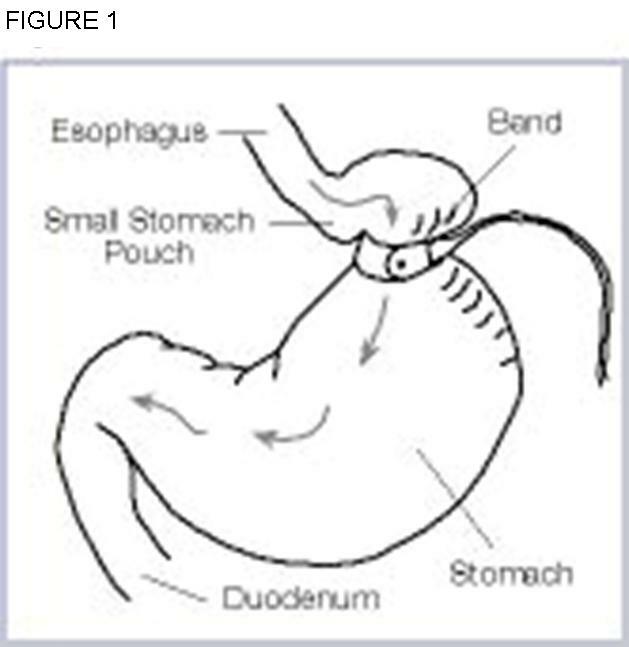 With lap band (figure 1), the fluid filled balloon around the stomach is holding constant pressure around the stomach. As the stomach fills and food moves through there is movement which leads to pressure and friction. This can lead to ulceration under the band. If this goes through to the inside of the stomach, GI contents can leak into the body cavity leading to emergency surgery and potentially lethal peritonitis. The balloon can rupture and then the effect of restriction is lost. The band needs to be “adjustable” because the size of the opening has to be exact (too big, and food goes through too fast to be beneficial and too small, food gets stuck.) They can’t make it exact due to variability in the gathers of the stomach as the purse string is pulled. This means that we have to have a port (a tube that comes to surface to either add or take away fluid to change the pressure applied). This tube can flip or twist. It is difficult to secure the band so it can also slip up and down. This can suddenly obstruct food–also requiring emergency surgery. If food is not chewed well, it can also get stuck even if the band is in the right place and is the right size. Some medication is too big to go through the band. If irritating medications such as ibuprofen get stuck it can ulcerate from the inside out. 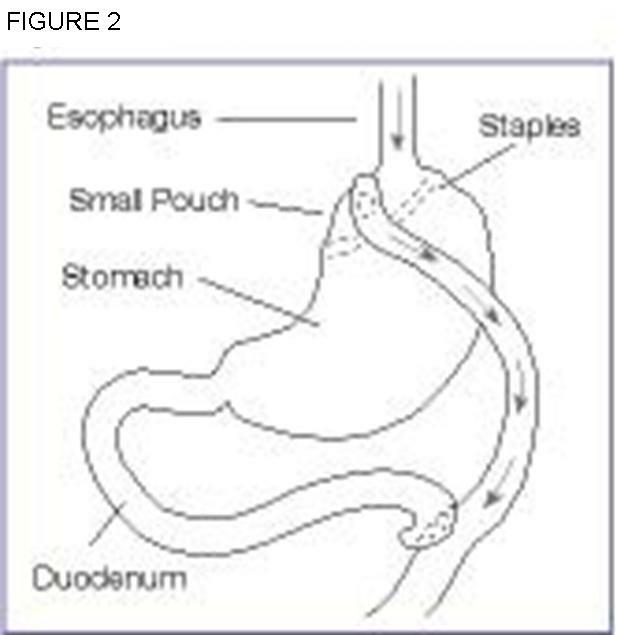 With Roux En-Y (figure 2), there is a staple line across the whole stomach. Food never goes into the bottom of the stomach. Instead it is re-directed into the intestine. How much of the intestine that gets bypassed, varies with the procedure; the more that gets bypassed, the more the weight loss, but the more complications from malabsorption. The staple line or the anastamosis (connection of the intestine to the stomach) can leak which leads to emergency surgery and potentially lethal peritonitis. The acid that is supposed to digest food is in the stomach but the food is in the intestine. Protein needs enzymes from the pancreas and fat needs bile to break down. Since these don’t mix, protein is not absorbed well. You need protein to build tissue. Fat is not absorbed well either. You may not think this is a problem, but you need a certain amount of fat to absorb fat soluble vitamins, and build tissue. The bigger problem is what happens to the fat if it does not get absorbed. If protein and fat aren’t absorbed the only thing that is absorbed is carbohydrate. When carbs get absorbed and the body responds with insulin, if there is no protein or fat, the insulin lasts longer than the carb and the blood sugar drops rapidly leading to being shaky, jittery, fast heart rate, decreased brain function and can lead to passing out. This is known as “dumping syndrome.” Hypoglycemia is bad in the short term, but new evidence is showing how harmful it is on the long term as well (increasing risk of cardiovascular disease.) Another problem is that the part of the intestine that is bypassed is the part that absorbs things like calcium, B12, iron and other nutrients. Even if these are supplemented, the part that absorbs them is bypassed. Another problem is that stomach acid is in the stomach without food. If you take an antacid it will not end up where it needs to be. Another problem is that the body is smart and while it can be fooled for a while, it will find ways around restrictions over time. The body is fooled when the stomach feels full, but you can still be hungry even with a full stomach. To understand what I mean, the next time you are really hungry, eat a big bucket of celery. Eat until you can’t eat anymore. You will likely still be hungry, even if your stomach is full. So often over time people end up eating more calorie dense foods to get needs met and feel full at the same time. Therefore, often at least some of the weight lost is re-gained. I am not willing to say that no one should make the choice of having surgery, but I do think that to be fair, an individual needs to know both the pros and the cons and be able to make an informed choice. Often people only find out the cons after surgery. In my opinion to tout bariatric surgery as a cure without the rest of the story especially to those so desperate for a solution is just not fair. 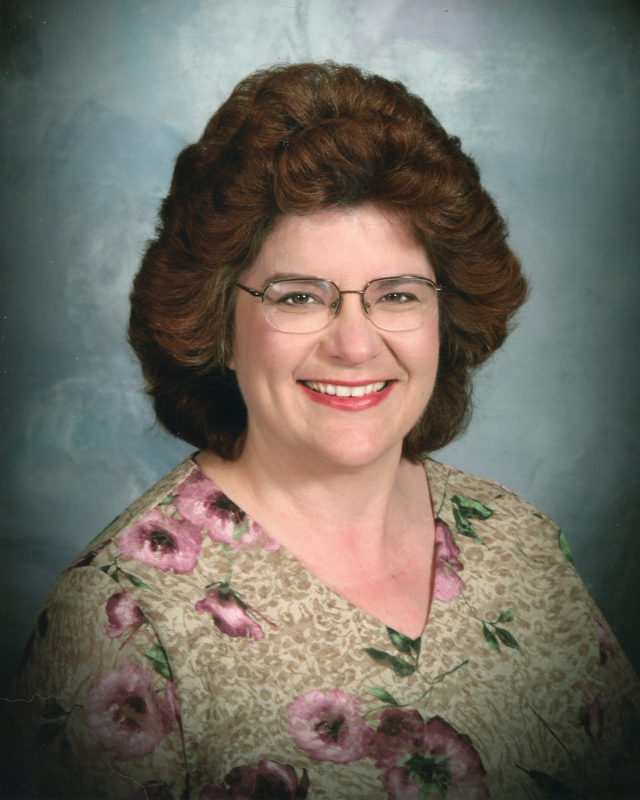 Laurie Klipfel, RN, MSN, BC_ANP, CDE has been a nurse and a Certified Diabetes Educator for more than 20 years. She has been a nurse practitioner specializing in metabolic syndrome (diabetes, obesity, hypertension, and hyperlipidemia) for 10 years. Laurie is an author and a featured speaker for PESI healthcare. She has been a member of the American Association of Diabetes Educators (AADE) for 20 years and is past president of the St. Louis Chapter of AADE. Laurie is a new member of ASDAH.